After celebrating 40 years of punk rock in Parc Jean-Drapeau last year, organizers behind '77 Montreal have lifted the curtain on the lineup for their 2018 event. 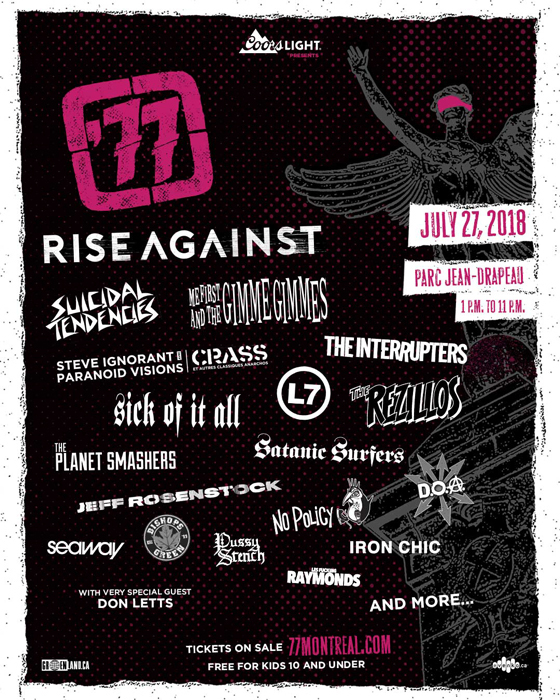 Returning to the outdoor venue on July 27, the day-long fest's bill is led by Rise Against, Suicidal Tendencies, Me First and the Gimme Gimmes and L7. Following closely behind are Steve Ignorant with Paranoid Vision, the Interruptors, Sick of It All, the Rezillos, the Planet Smashers, Jeff Rosenstock, D.O.A., Iron Chic, Seaway and more. Tickets for the fest are currently on sale, with a general admission pass going for $70 including taxes and service fees. Admission for children 10 and under is free of charge. '77 Montreal also promises a premium food and drink garden, vendor market and more. Further festival details can be found here.